Today we received a surprise gift—a warm sunny day at the end of winter. Makes me think of summer days and picnics and salads. This is a delicious and pretty side dish for grilled or baked chicken or fish. It’s super easy and makes a perfect picnic salad since it has no dairy ingredients. 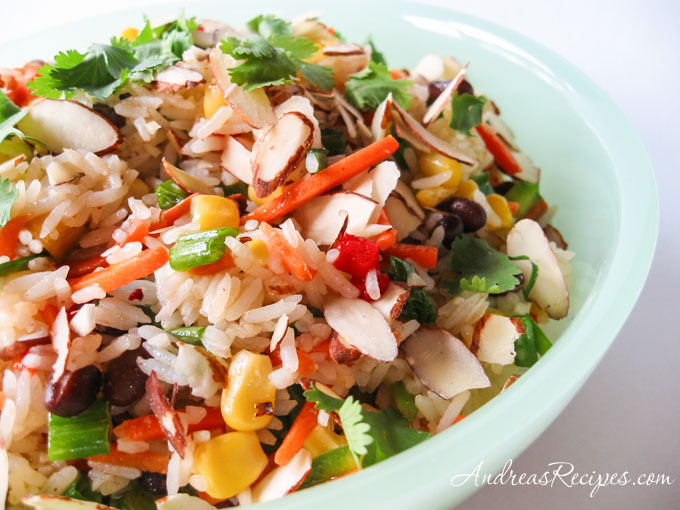 There are many, many ways to make a confetti rice salad, this just happens to be a favorite for us. Check out the variations list below and come up with your own! 1. Combine sugar, rice vinegar, pepper, and salt in jar. Screw on the lid tightly and shake well. Let it sit for about 30 minutes at room temperature to ensure that the sugar and salt dissolve completely. Add the olive oil and shake again to mix it well. 2. Stir together rice, pimientos, bell pepper, scallions, corn, and beans in a medium bowl. 3. Toss the vinaigrette with the rice salad, then garnish and serve. Toss it all with your vinaigrette of choice. I made this yesterday for a party- I opted to use mint and almonds. It was very good and light, I would up the salt and pepper- just a bit. Also, your navigation bar made it easy for me to find a recipe that worked for my event. The requirements were- salad, non-dairy, easy. Thanks Andrea. Great! I’m glad you liked the salad, it’s a favorite of mine.